So.. how does it work you ask? I pre-asses my students at the beginning of each unit. Make it easy on yourself and just give them a five question multiple choice sheet that covers the topics of the unit. That way you can QUICKLY assess their strengths and weaknesses. I have to use our district Common Assessments, but it accomplishes the same thing. Next, I group them according to the results. I use the Cardinal Directions as groups because it is a Compass Rose, shaped like a cross. There is not really a top or bottom because all four sides are important to find your way. I usually play around a little bit with the East and South groups to even out the number of kiddos. I also assign each student a partner who is in their group to play at the game station. Now remember, these groups are flexible. I am constantly monitoring my students to see if they need to change groups. I will usually get a few kids who can move up to West (advanced) and some kiddos who move up from North. I have had a student or two who has moved down to North for a few lessons. You are meeting your kids where they are. I also DON’T do stations EVERY Day. I do it MOST days!! Notice that North group begins with the Teacher. This is so your low group is the first group of the day and they go directly to their desk to practice after meeting with you. West group on the other hand, meets with you last. The first thing that they do is practice. These kiddos can usually start an inquiry based activity alone and then meet with you later to discuss it. Or you can have them practice something from yesterday’s lesson. Once I have all my little honey buns in groups, I teach them about the rotations they will be making each day. Each rotation is "supposed" to last for 10 mins. I have been "flexible" with my timing for each group, depending on their understanding of the lesson. There are four rotations: Teacher, Desk, Game, Fast Facts. While I don’t do a whole group lesson at the beginning, we do come back for share time to talk about our new learning. This is when the kiddos come to me at the carpet or small group table for the actual lesson that is presented on their level. Your middle groups are easy to plan. You just use your Math Program. North and West are more tricky. You have to plan specifically for them. I do A LOT of hands-on activities with my North group. While I am teaching a modified version of the curriculum, I am still expecting to get them to be successful on the grade level assessment. This takes flexible planning on your part. I KNOW my end goal and how I need to get them there, but I have no idea if this group will “get” the lesson or if I will need to reteach in a different way. I am prepared either way. West group needs a challenge. These are most likely your gifted learners. They do NOT need MORE work. They have already proven to you that they have met the grade level expectation. These kiddos can work on performance events and projects. You will still be teaching them, but something more advanced. Where do I get my resources? I have a game for each skill. I usually keep the same game for one week so that I only have to explain it once. Some games are differentiated and some games are not. We may play a game from the current unit or we may play a game from a previous unit to review skills. Now it will show them all the problems they missed and how much time it took to complete. To pass and be able to move on to a new test the next day, they can only miss ONE and their time must be 3 minutes of less. Now I tell them if it is a couple of secs over that is ok. When they finish they print the test and go grab it. (My kiddos have to hustle to the library.) Next, they make flashcards for any of them that they missed. While kiddos are waiting for the computer, they are practicing their flashcards from the previous day. 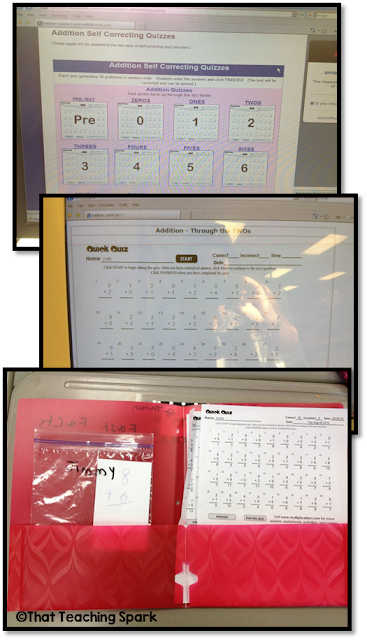 I have also had students use www.xtramath.org for math facts. I highly recommend this site. We use it for homework now instead. If you have access to more computers, I would recommend www.frontrowed.com This site is AMAZING! It gives pretests for all CCSS standards and builds a program for each student! 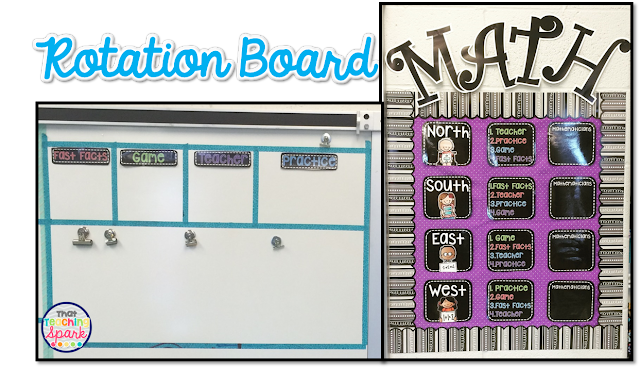 I hope that this has been informative and given you some ideas for your classroom! 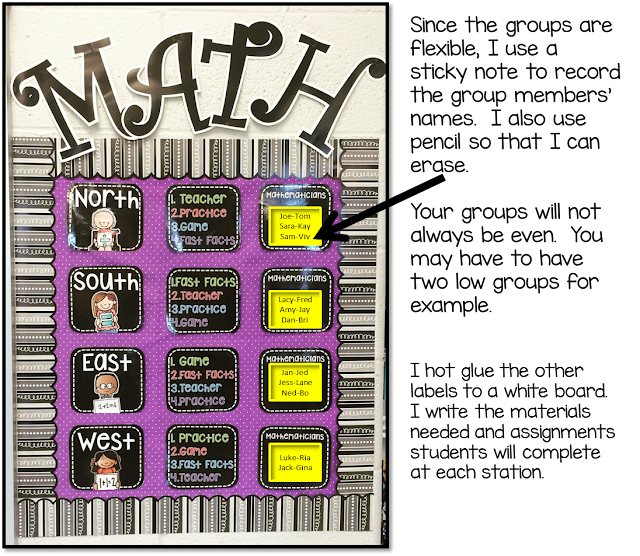 If you would like to purchase my Math Rotation board, click here. Amy, I loved your post! I've been wanting to start math groups for some time now, but with testing I'm always concerned that I won't be able to cover all of the material. I definitely think groups is the way to meet all of the kids needs. I think sometimes we just need to close our eyes and jump in! 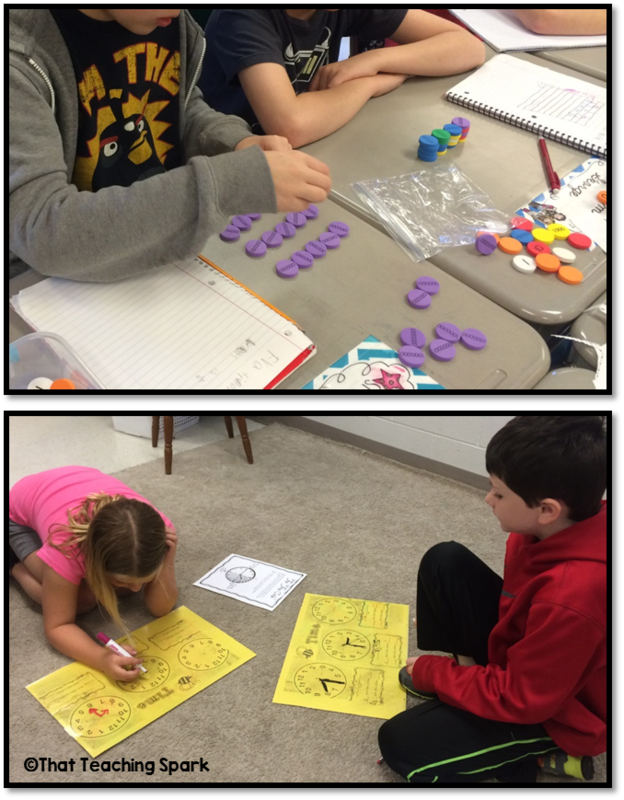 Thanks for breaking math groups down into what seems like a doable task.